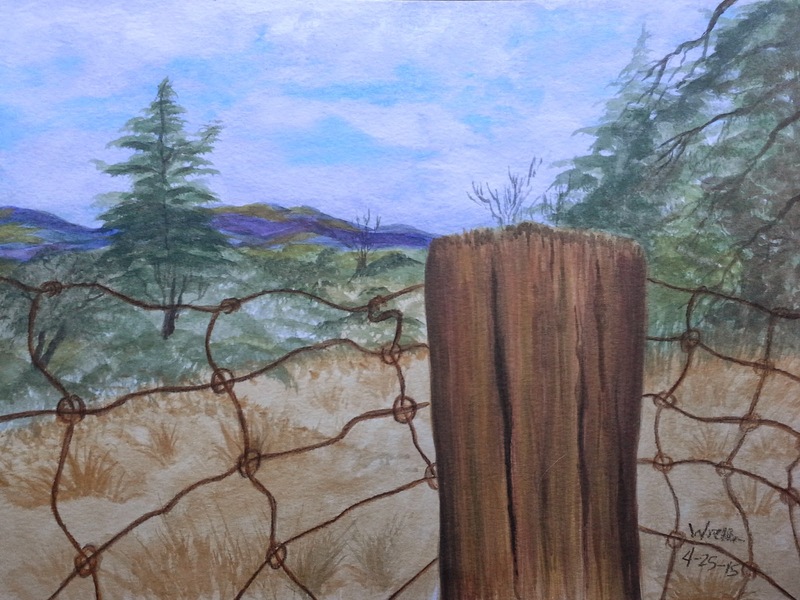 My muse struck again, this time I decided to paint from one of my photos of the property. This is the view looking toward the west, the wooden post came from a friend's house, the rusted wire came from a local ranch that was replacing their fencing, we got a few rolls of that wire. Lots of history in the post and wire. I did this on Fluid Watercolor Blocks, 130 lb, 9x13 , I used Derwent Inktense blocks and pencils to paint the picture, I started it about a week ago and put the finishing touches on it today. This is the first time I've used watercolor block paper, it's watercolor paper that is glued down on 2 (or more) sides so you can wet the paper without fear of buckling or warping, I really like it. This is the cold pressed paper, I just ordered the same brand and type but in a hot pressed form, I can't wait to try that. I plan on painting from the reference photo again, maybe several times, I really like this view, and I need to polish up my trees, they look just fine here, but MY trees are more rounded (more cedar like-less fir like), I also want to improve the mountains in the background and the sky, basically everything, I'm very happy with the wooden post and the rusted wire. I am giving this to a friend for her birthday, she saw it last week before it was fully completed, she liked it. I'm pretty happy with it too :) This is the first full page landscape painting I have done in quite a number of years, I'm thinking the last time I painted anything like this was over 30 years ago, I'm happy to get back into the swing of painting. I am following a wonderful artist Rebekah R Jones, she does art journaling in Bibles, this intrigues me very much, I added more links to Rebekah at the bottom of the page. 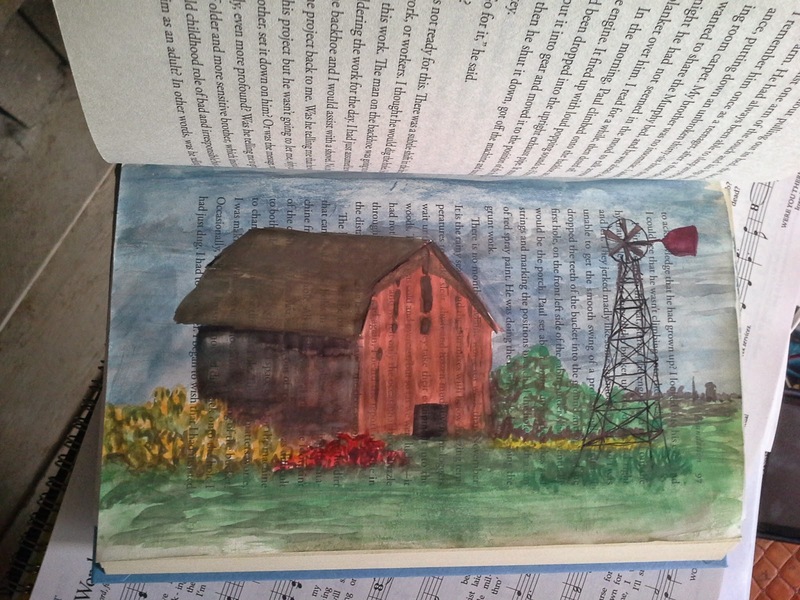 This is my second attempt at art journaling in a book, I will eventually start working in a Bible, but want to get better (and more confident) before I start working in my Bible. 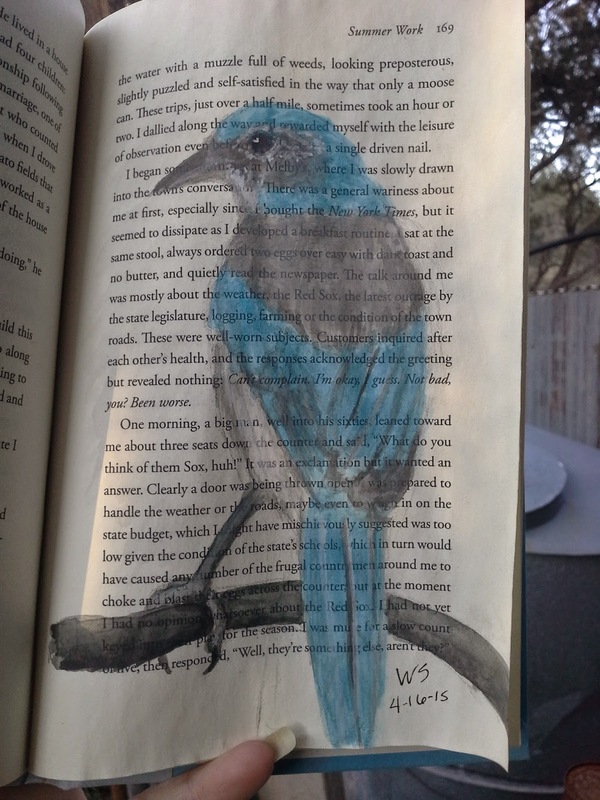 Here is my first attempt, I had to find a book I was willing to practice in, fortunately we have a plethora of books around here :) I also went to our local library and local used bookstore recently and found a Bible and another book that lays flat quite nicely. This picture was done in watercolor and ink. I joined a free site called Paint My Photo, it's a place where very fine photographers upload their photos specifically for artists to use as reference, I have been uploading pictures of my local area, landscapes, animals, flowers and such. This is my first painting done from a photo there. Rebekah R Jones blog, FaceBook, YouTube, Pinterest.